Merry Christmas!!! Let me guess...Santa brought you a Silhouette machine and now you're wondering how in the world do I get started with this thing? Silhouette CAMEO beginners, Silhouette Portrait newbies, and Silhouette CURIO first timers, you've come to the right spot! I know what it's like to be you because exactly two years ago today - I was YOU! I received my first Silhouette machine, a Portrait, for Christmas 2013. Here we are almost 600 Silhouette tutorials, 5 machines, and three ebooks later...so believe me, you got this! I'm here to help! I know it can be intimidating and overwhelming and the possibilities to create are pretty much endless...believe me, I know! It's even a bit of a brain buster to know what to 'search' here on Silhouette School when you're such a newb. So don't even worry about a thing because I have 10 must know tips for you...and I have some advice for Silhouette beginners that you can't miss! 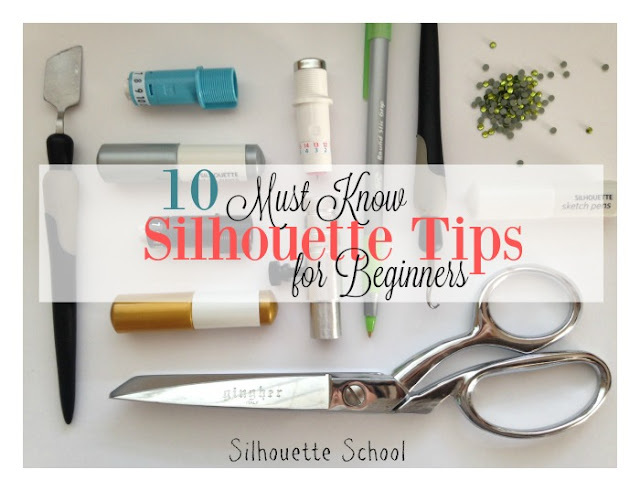 You can also find my recommended accessories tools to get started here So without further ado...here are my top 10 Silhouette beginners tips, tutorials and tricks to get you off to a good start! 1) Take it Out of the Box - You think I'm joking. I'm not. This thing isn't going to cut itself. Take your Silhouette machine out of the box, install the Silhouette Studio software on your computer, plug it and start playing! The free Silhouette Studio designs that come with your Silhouette machine and software will appear in your Silhouette Studio library after you've 1) installed the software, 2) plugged your machine into the computer through the USB cable and 3) powered on your Silhouette machine. Your library can be found by clicking the icon that looks like a book towards the bottom of the left sidebar in Silhouette Studio. 2) Get Designer Edition - Before you even start playing with Silhouette Studio, I suggest you immediately upgrade to Designer Edition. The one-time only paid upgrade opens up a lot of very useful functions - including these 13 that I can't live create and design without. You can purchase Silhouette Studio designer edition here. You will receive a license key to activate DE. Here is a step by step on the quick upgrade process. 3) De-Stick Your Cutting Mat - Your Silhouette cutting mat will be overly sticky when it's brand new. Use a clean cotton pillow case or t-shirt to blot it a few times to de-stick it slightly. This will prevent your materials (vinyl and paper, specifically) from curly or ripping when you attempt to remove them from the mat after cutting. 4) Built in Ratchet - You can throw that little gray blade ratchet out....no use trying to keep track of it when you have a built in ratchet on your machine! Put your blade into the ratchet and turn to the desired blade depth! For the Curio, the built in ratchet is on the base platform. 5) Test Cut - I repeat test cut! The test cut is a feature that makes a small half inch square and triangle in your material using the current cut settings. It allows you to preview if the current settings are accurate or need adjusting before you commit to cutting your entire design. The test cut feature can be found by scrolling to the bottom of the in the Cut Settings window in Silhouette Studio. 6) Use Your Grid Lines - Reveal the grid lines from the Page Settings window! They'll show up on your virtual mat in Silhouette Studio and they match the lines on your Silhouette Studio cutting mat perfectly so you'll know exactly where to place your material to match where your shape will be cut! 7) Undo will be your BFF - The Undo tool along the top tool bar will quickly become your best friend. It will undo any edits you make...press it repeatedly to undo a series of edits. 8) Welding Script Fonts: When cutting script fonts that you want to cut as a single word instead of individual letters, you need to weld the letters together. Do this by selecting the entire word > right click > weld. Will will join the letters together and eliminate the cut lines in the overlapping areas. 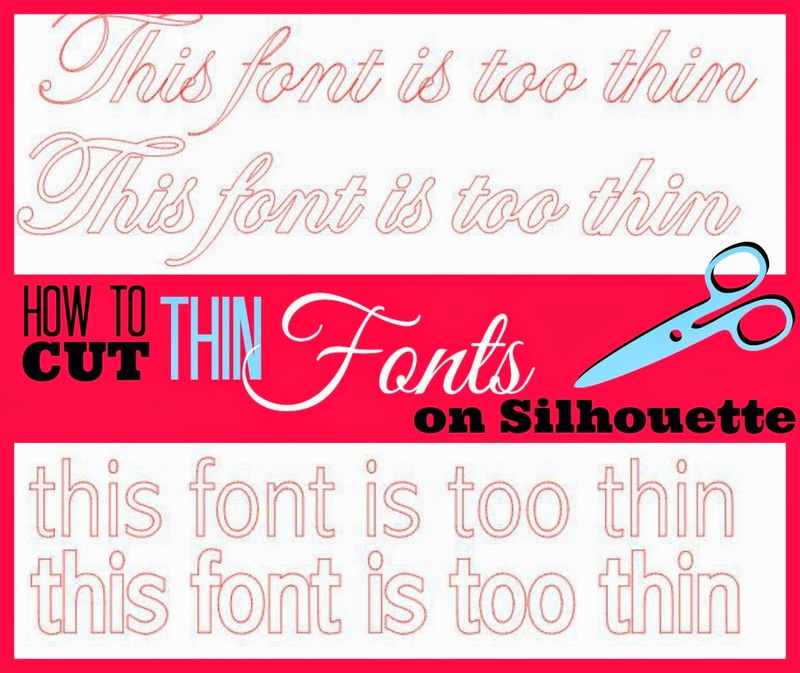 9) Thicken Thin Font: Thin fonts can be extremely frustrating to cut because they often tear. Make things easier on yourself by adding a small offset to the text. Cut the offset and delete the original. For a full explanation read this tutorial. 10) High Pass Filter: When using the trace function, turn off the high pass filter. You will have no idea what this means on Day 1 - but keep it in mind and when you're ready to trace a jpeg or an imported design, remember to read this tutorial on getting a better trace! 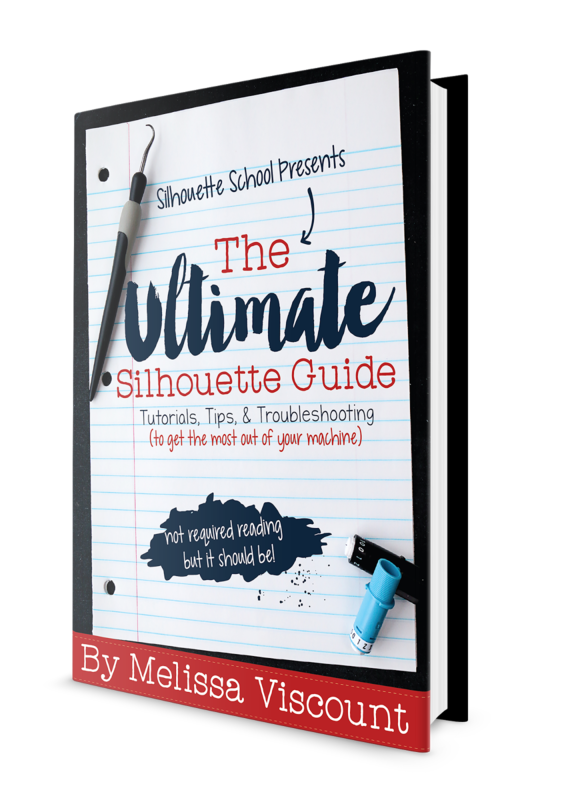 11) Pick up a copy of The Ultimate Silhouette Guide! My 140 page ebook will teach you everything The Ultimate Silhouette Guide! You'll learn the lingo, master every tool in Silhouette Studio, have troubleshooting tips at your finger tips, and a Silhouette tutor in your craft room! 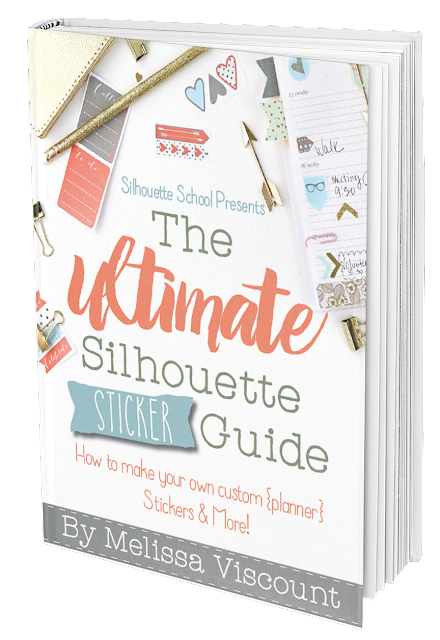 Get The Ultimate Bundle which includes The Ultimate Silhouette Guide AND my newest ebook The Ultimate Silhouette Sticker Guide. Need a second opinion on some must-know tips for Silhouette beginners? A few months back I asked Silhouette School's Facebook followers what one piece of advice they'd give to first day users...check out what they had to say! Pop Quiz: If you could give a first day Silhouette beginner one tip, what would it be?! And don't forget to subscribe so you get Silhouette School lessons delivered to your email inbox! Select Once Daily or Weekly. you are so great, thanks a lot for this helpful information. I just got a Cameo after having a really old school Silhouette SD. With updating the software, I now have a lovely diagonal cut line across every cut. I've tried the software fix to no avail. Believe me, I know how to use the machine, how to adjust the blade, etc. etc. etc. I'm so disappointed. This is even my second Cameo; I sent the first one back to Overstock.com. I'm ready to send this one back too. Can you give any other solutions to the diagonal line that ruins design after design? Have you checked that your software is still registered? That diagonal is sometimes used on software during a trial period. Just a thought. Wow... I am going to like this website. Had my machine over 2 years now. Hated it. Wish I had known Hint #3 from the get go. I have ripped up every design I have made (very few) because I could not get them off the mat. I then ended up etching the mat with deep grooves, and after a few more irritations, I gave up and put it in the box. I may have to actually pull it out again and try to make it work for me! Great information.....can't wait until I can get the 3!! !